Combining the Honda and Husqvarna names, the Husqvarna HU700FH has great power but runs fairly quietly. Starting on the first or second pull, it runs smoothly up and down hills. The variable speed control, located on the handles, gives you the ability to set the pace, and the grips on the handles are comfortable on the hands. We liked that the bagging feature shoots grass all the way to the back of the bag, preventing clumps from blocking the front of the bag and forcing you to empty it repeatedly. 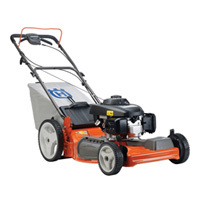 For the price of $329, the Husqvarna HU700FH offers superb traction and maneuverability around obstacles.